An allergy or an allergic reaction is an abnormal immune system response to certain stimuli, like food ingredients or dust. Our immune system normally functions to protect the body against infections and any other threats, but under certain circumstances our immune system can malfunction. Individuals who suffer from allergies have certain abnormalities in their immune system response, causing it to mistakenly react to certain substances as if they were harmful to you. This defensive reaction that is triggered by exposure is known as an allergic reaction, and the substance that triggers the immune response is known as an allergen. There are various allergens that could produce such reactions and they could include certain ingredients in your diet, dust or smoke, pollen, chemicals in certain drugs or certain resins, oils and cosmetics. Before turning to any natural allergy remedies it should be kept in mind that the most important step would be to eliminate or minimize any exposure to the allergen before attempting to use any home remedies for an allergic reaction. So How Exactly do Allergies Work? Our immune system produces IgE antibodies to protect against any foreign invading organism, whether a bacteria or virus, and it responds in the same manner to an allergen. When you have an allergy, it basically means that your immune system recognizes the allergen as a threat, even though it isn’t, and it reacts accordingly. Under normal circumstances this would help protect you against a potential infection. The antibodies thus produced, cause certain cells to release histamine into the blood stream. Histamine then travels through the blood stream and can cause reactions that are observable as allergic reaction symptoms in various parts of the body such as on the eyes, the nasal or respiratory passages, on the skin and even in the gastrointestinal tract. Although this may explain how an allergy works, it doesn’t really explain the effects of an allergic reaction. The word 'allergy' means an altered or abnormal tissue reaction after exposure to an antigen (also called an 'allergen'). The allergic reaction occurs if the body tissues are sensitive to the allergen. The allergen may reach the tissues by direct contact with the skin or various mucous membranes of the organs or through the bloodstream after absorption. 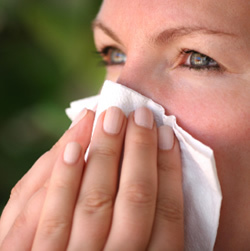 Almost any part of the body can be affected by allergies. 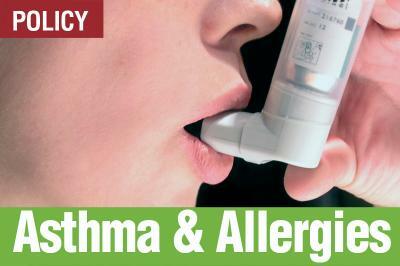 There are a wide range of substances and even weather conditions that can cause an allergic reaction. Some of the most common substances that cause allergies are dust, pollen, animal hair, and cosmetics. Poisonous plants like poison ivy and poison oak can also cause severe allergic reactions. Serums, drugs, and vaccines can also cause an allergic reaction. Extreme weather conditions, especially extreme heat or cold, are also known to trigger allergic reactions in some individuals. Food allergies are among the most common of all types of allergies and some of the triggers for a food allergy include milk, seafood, peanuts, strawberries, and chocolates. Oranges, eggs, and tomatoes are some of the other foods that can also cause allergic reactions. An allergic reaction is not an uncommon condition and almost all of us either suffer from some allergy or the other, or know of family members or friends who suffer from an allergy. 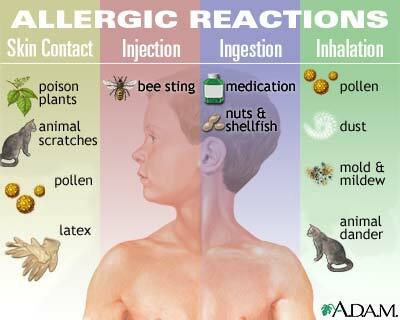 As varied as allergens are, are the reactions they produce and the severity of allergic reactions. An allergic reaction to the same allergen will also vary among different individuals, and while one individual may simply suffer from non threatening symptoms like hives or mild skin inflammation, another individual could suffer anaphylaxis, a life threatening emergency. While there may be no definitive or guaranteed cure for allergies, there are many treatments and methods of therapy that are believed to help increase an individual’s tolerance of allergens, thereby reducing the risks of and the severity of an allergic reaction. 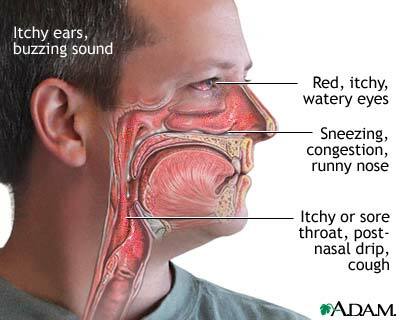 Respiratory Allergies: Spring allergies with sore throats or other seasonal allergy symptoms are generally caused by airborne allergens in the environment like pollen. The process of pollination is naturally seasonal, which is why allergies of this nature are referred to as seasonal allergies. While pollen may the biggest cause of respiratory allergies in some parts, dander from animals, certain moulds and dust mites also act as allergens that are often responsible for allergic reactions that could involve sneezing, coughing, watering of the eyes and nose, or more severe asthma like symptoms. Insect Bite or Sting Allergies: Allergic reactions to insect bites and stings are also not uncommon and this is particularly problematic during the summer months when most of us spend a lot of time in the outdoors. Insect sting allergies can produce very severe reactions in some individuals and the symptoms could vary from exhaustion, local swelling, dizziness, hypo tension, and in severe cases anaphylaxis. When considering allergic reactions of this nature, wasps and bees pose the biggest threat. Food Allergies: Food allergies are among the most common of all allergies and the reactions to food allergens could vary greatly, with some individuals experiencing severe diarrhea or flatulence, while others may experience eczema and skin rashes or swelling of the throat and hypo tension. In severe cases the condition can even be life threatening with anaphylaxis. The most common food allergies are caused by exposure to peanuts, milk, egg proteins and various types of sea food. Seafood allergies are the most common type of food allergy and affect almost 2% people in the general population. The incidence of cases of seafood allergies is higher in countries like Spain, Japan and Scandinavian countries where seafood is a major part of their daily diet. Contact Allergies: Contact allergies or contact dermatitis can be caused by exposure involving direct contact with certain substances that could act as an allergen like some metals, fragrances, or latex. Nickel allergy is probably the most common type of contact allergy. Symptoms of allergies caused by direct skin contact could include itching, inflammation and burning, or the formation of blisters on the affected area. 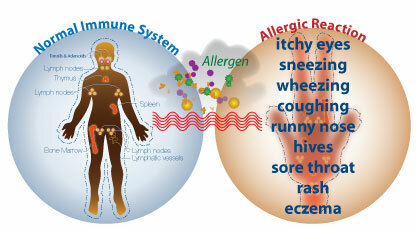 Allergic symptoms are manifested in various forms in different organs. These include recurring headaches, migraines, dizziness, irritability, nervousness, depression, neuralgia, conjunctivitis, eczema, hay fever, a stuffy or runny nose, diarrhoea, vomiting, urticaria, asthma, shortness of breath, and swelling of the face and eyes. The same substance can cause different symptoms in different people at different times. While most allergic reactions are mild and non-threatening, like a runny nose, some symptoms can be a lot more severe as would be the case in an asthma attack caused by an airborne allergen. While the symptoms of allergies usually are connected to and influenced by the type of allergy responsible this is not always necessarily the case and some types of allergies also produce multiple symptoms. For example, one would typically expect an allergen that is consumed (a food allergen) to cause symptoms like diarrhea, nausea and vomiting, but it could also cause hives, difficulty breathing and various other symptoms. In some cases the allergic reaction can turn very severe and the symptoms caused by such a severe reaction are referred to as anaphylaxis. In such a scenario the individual not only experiences difficulty breathing and swallowing, but there is also severe inflammation of the lips, tongue and various other parts of the body and the individual may even experience a loss of consciousness. A food allergy is often an indication of an unhealthy and imbalanced diet plan as well as an unhealthy lifestyle. An allergy can also be caused by the excessive and regular consumption of processed and refined foods. This is because these foods invariably contain chemical additives and flavoring agents which can trigger a severe allergic reaction. Stress and emotional upheaval can also aggravate an allergic reaction. The exact reasons for the development of allergies are not clearly understood, but some individuals may have a predisposition to developing allergies because of genetic factors. Although there are lots of theories and debate over the possible causes it is understood that certain factors do increase the risk of developing allergies other than heredity. Environmental factors such as the sudden increase in the presence of certain pollutants or even natural allergens could cause a person to develop allergies. Changing patterns of natural vegetation and climatic changes, as a result of global warming could also contribute to the increasing incidence of allergies. Researchers also indicate that increased levels of personal hygiene and the reduced levels of exposure to infection and disease could account for immune system malfunctions, as the traditional function of our immunity would then be reduced. This trend is believed to account for the higher incidence of allergies in more developed parts of the world, as compared to in developing nations. Certain nutrients have been found beneficial in the prevention and treatment of allergies. Often the intake of vitamin B5 or pantothenic acid brings great relief to the sufferer. This vitamin may be taken in a dose of 100 mg daily for a month. In such cases, liberal amounts of pantothenic acid help even though the recovery takes several weeks. A dose of 400 mg of vitamin E taken daily for four to six weeks is also beneficial as this vitamin possesses effective anti-allergic properties. It is found that five drops of castor oil added to half a cup of water or any fruit or vegetable juice, if consumed on an empty stomach each morning, can be beneficial for various allergic reactions that affect the intestinal tract, skin, and nasal passages. Lime is considered an effective remedy for any kind of allergy. Half a lime may be squeezed in a glass of lukewarm water and sweetened with a teaspoon of honey. It can be taken once daily first thing in the morning for several months. This remedy not only flushes the system of toxins but also acts as an antitoxic and antiallergic agent. Gingko biloba is one of the best herbs for allergies like asthma and other respiratory allergies. The leaves of gingko biloba contain vital properties which help in activating platelets in the body which in turn help in fighting allergies like asthma. It also contains natural antihistamines and anti-inflammatory chemicals which are very effective in fighting various allergies. The Reishi mushroom has been widely used in Chinese medicine for problems like allergies, asthma, hypertension and various other liver problems. The Reishi mushroom is one of the most effective natural herbs for allergies as it contains powerful anti-inflammatory properties and antihistamines which can effectively fight a variety of allergies including asthma. Natural treatment is generally preferred by most individuals in the treatment of allergic reactions because of the recurrent nature of allergic reactions. Repeated or frequent use of pharmaceutical drugs can have severe health consequences and most individuals prefer to avoid them when dealing with mild allergies. Skin allergies on the face, hands, torso, and even on the limbs are quite common and you could try using home remedies for a skin allergy. Apart from contact allergies, food allergies may also cause a puffy face or other skin inflammation. Keep in mind that most natural home remedies for allergies are simply meant to provide relief, as there are no known allergy cures, natural or otherwise. Allergy remedies during pregnancy can be particularly helpful, when the intake of most pharmaceuticals is advised against. But some natural ingredients can be just as potent and may threaten your pregnancy, so it would be advisable to check with your physician. Similarly allergy treatment and remedies for babies and children may offer some advantages, but the severity of reactions can also be a lot more threatening in kids, which is why medical attention is advisable. An allergy is an erroneous reaction of an individual’s immune system to a harmless substance that it perceives as a threat. This hypersensitivity to a substance can cause a recurrent allergic reaction that is more severe than the first. A juice fast for four to five days can help to restore normal immune system functioning. It would be wise to follow this type of a fast on a regular basis as this will regulate your system and may even help to create a tolerance to the allergen. A mono diet of vegetables or fruits is an extremely effective follow-up diet after the juice fast. For the first week, the patient should have fruits like grapes, or apples and vegetables such as carrots, cucumbers, and green leafy vegetables. During the second week, another food product can be introduced into the patient’s diet and during the third week yet another food product should be included. After the fourth week, the individual can add protein-rich foods to his/her diet, making sure to add just one new food product at a time. As soon as the individual suffers from an allergic reaction, it should be eliminated from the regular diet. Once the patient’s not longer has symptoms of a food allergy, he/she can start to add new food products to this diet plan. In this manner, it is possible to determine which foods cause an allergic reaction and they can then be avoided. You will need to avoid coffee, tea, colas, and all alcoholic beverages. You would also need to avoid chocolate and refine flour and sugar products, especially bakery products like pastries. Fish and milk products should be avoided along with salted, pickled, or smoked food products. Preserved food products, especially those with chemical flavorings and preservatives must be eliminated from the individual’s regular diet. Food allergies are among the most common of all types of allergies. Addressing food allergies with home treatments such as with dietary changes is not only practical, but extremely effective. Some of the most common types of food allergies include wheat food allergies, corn food allergies, and wheat or gluten allergies. Raw milk allergies are also quite common in babies. Common food allergies tend to cause hives, and such a food allergy rash can easily be treated with common diet home remedies for allergic reactions like hives and rashes. 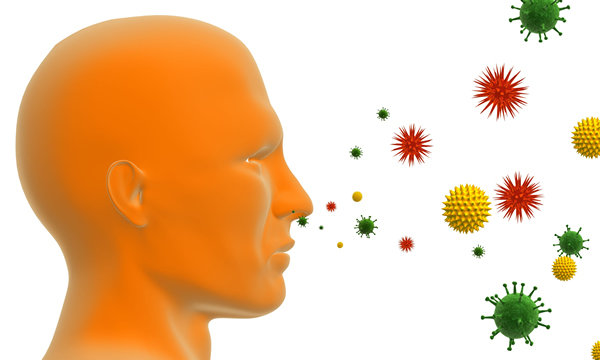 As with any allergy, the key to treatment is avoidance or limiting of exposure to allergens. A corn allergy diet or a gluten allergy diet would therefore imply diets free of any corn or gluten containing ingredients. If it is determined that the patient is suffering from elevated stress levels, relaxation methods such as deep breathing exercises and meditation along with regular exercise can help to reduce the severity of the allergic reaction. This will help in the treatment of allergies. Certain yoga asanas like the Half Spinal Twist Pose (ardh-matsyendrasana), the Shoulderstand Pose (sarvangasana) and yogamudra - which are essentially hand postures can be effective in helping to treat allergies. The corpse poses (shavasana) and the alternate breathing method anuloma-viloma pranayama are also very beneficial in the treatment of allergies. Using acupuncture for allergies has also become a popular treatment option these days. Many people resort to these forms of treatment to avoid side effects which can be caused by conventional medications and drugs. Acupuncture for allergies not only helps in treating the various symptoms of allergies but also restores the natural balance of the body so that such allergies can be avoided in the future. The acupuncturist places small sterile needles on the point of the allergy symptoms or pain such as the sides of the head and nose so that energy can move freely through the body. Allergy symptoms like headaches, itchy eyes, stuffiness and breathlessness can all be cured completely with acupuncture. By using acupuncture for allergies the underlying cause of various allergies can also be treated to prevent the recurrence of such severe reactions in the future.